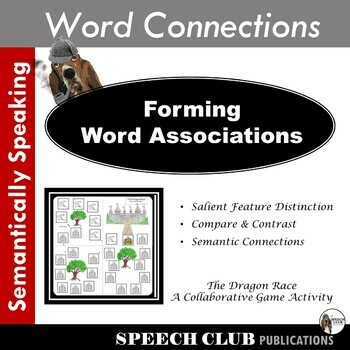 Semantically Speaking – Forming Word Associations: Understanding Word Connections targets building word relationships. Activities focus on identifying the salient features that characterize words and improving the perception of word relationships. Semantic networks are enriched by perceiving, abstracting and categorizing linguistic relationships. The word sets card deck targets a deeper comprehension of word meaning flexibility, word distinctions and shared dimensions. Word Connections – 4 words are presented and the students must determine in what way the four words are related or connected.